Reports of the death of the Trinity-Bellwoods white squirrel were greatly exaggerated. Last month, a photo of the famous critter, electrocuted and hanging limp from a power line, circulated on social media, leading some to suggest the rodent who inspired the name of a cafe and a city laneway was no more. 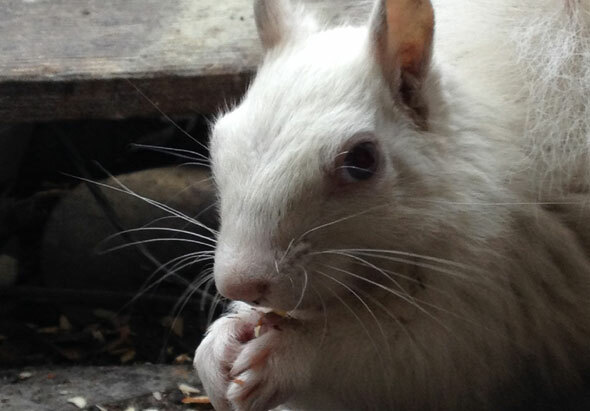 Luckily, there's more than one white squirrel in Toronto. Jess Hogge works at Wildhagen Hats at Queen and Portland. She says a white squirrel has been visiting the store's rooftop for months. "We had a black squirrel that would come on the roof," she says. "And then all of a sudden I saw a long white thing. I thought it was a ferret at first, so I called my boss over and opened the door and it was a white squirrel. "We figured out it was a girl because it showed up looking quite large in the spring, and then quite thin the next time it came," she says. "This is the weird thing: I know there's not that many in the city, but we've been considering there is two visiting. One will come right to your hand and is very bold - it's actually come in the shop before. One is a bit more standoffish. "There might two, there might be even more, or it might just be one that's just really moody." One way to be certain there is more than one squirrel is to look in their eyes. Albinism, a congenital disorder that causes a lack of pigment in the skin or fur, also tends also to lead to red or pink eyes in animals. The Trinity-Bellwoods white squirrel in this photo has red eyes, but the one that visits Wildhagen Hats has light blue eyes, Hogge says, though her photo (above) doesn't show it. Rob Nelson is an American scientist and wildlife expert who runs a website that tracks white squirrel sightings in the United States. He says albinism isn't the only reason a squirrel may appear white. Some of the tree-dwelling rodents may have white fur as a result of leucism, a separate genetic condition from albinism that also causes reduced pigmentation. Nelson calls these squirrels "white morphs." Like the visitor to Wildhagen Hats, these squirrels tend to have normal eye and other colouring. "We're not sure if it's a leucistic thing, kind of like how you get white boa constrictors or other animals that are white ... [contemporary sightings] might be 50/50 albino to white morphs, it's hard to tell the actual percentage." The fur of squirrels naturally ranges from a light sandy colour to jet black, leading some to mistake blonde squirrels for white squirrels. The city's dark critters are an example of adaptive melanism, a condition that causes animals to have higher than normal amounts of melanin, the opposite to albinism. Despite the range of appearances, almost all squirrels in Toronto are Eastern Greys, a name that belies diversity of species. Nelson thinks white squirrels might be more common in urban areas like Toronto due to the lack of natural predators. In their natural habitat, having bright white fur is a potentially fatal disadvantage. Albino animals tend to have vision problems, too. In places like Trinity-Bellwoods Park, where food is abundant, it's relatively safe to stand out. As part of his research, Nelson has also tracked some of the strange cultural phenomena around white squirrels. He says he's heard of towns in the U.S. trapping or killing non-white squirrels in an attempt to artificially boost the numbers for tourists. "There was one town in Missouri where not only were they trapping the other squirrels and taking the other squirrels out, they were bringing in extra white squirrels to their little town centre to make sure they had a fair number of them," he says. "There's weird people out in the country." Albinism is a recessive genetic trait that can be present in humans without causing a lack of pigment. According to the U.S. National Organization for Albinism and Hypopigmentation, both parents must carry the necessary defective gene to have a child with albinism, a fact that bodes well for areas with an established population white squirrels. 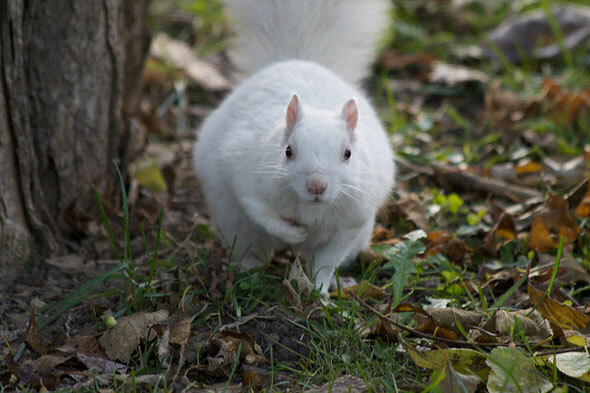 Nelson thinks Toronto's small population of white squirrels, which appears to be clustered around Queen West and High Park, could increase over time, especially if people are feeding and caring for them over their differently coloured brothers and sisters. "Squirrels breed fast," Nelson says. Image: Aaron Forster/blogTO Flickr pool, Jess Hogge.